Airing My Laundry, One Post At A Time...: Hey It's Okay Tuesday! To have liked the movie Gravity. Tom and I got to see it last week. We probably should have seen it in 3D though. It was still entertaining. To be going on another date tonight. We're going to see Captain Phillips. To really hope this government shutdown gets sorted out. It really bothers me when people blame sides. I've had to hide several Facebook people who think it's perfectly normal to constantly bash the Republicans. I'm not part of ANY party and tend to side more with the Republicans BUT I know it's not one side's fault. To hope the Geek Squad can fix my computer. Tom tried to figure it out but couldn't. So we turned it in yesterday. To have gone to Dallas last weekend. It was a blast. We went to the giant mall and went to Medieval Times. I'll write more in a future entry. To love how Tom's Mom cooks. She makes awesome foods. I hate cooking so I love when she visits. Yesterday she made potato salad, deviled eggs, and strawberry pie. She leaves Thursday. I'll miss her meals. To have two giveaways going on right now. You can win a Budsie here and a copy of Pacific Rim on Blu-Ray here. I'm with you on the whole government shut-down - I just want them to come up with a solution that everyone can agree on and move on!!! And, maybe because I only have boys, that American Girl store sort-of freaks me out, too!! I am SO glad Tom is home with y'all!!! The government shutdown makes me want to cuss, screw the (2) party system, just a bunch a pompous *****, see it makes me wanna cuss.... ARGH. To know I'm one day closer to being off work on Friday and next Monday! And I'm with you on this government stuff. I'm done with all of them. All sides. It is okay to have giggled at your comment about Tom's appall-ism over the American Girls store and their products! It is also okay to be concerned about the government shutdown, but to not want to hear about it on every single post you read on FB. I, too am not part of ANY party, but I tend to side with the Democrats, the opposite of you, but I agree with you here. Its no one's side. I'm just sick and tired of all this flying all over the internet. And TV. I would prefer to have heard about Myle Cyrus, I can say that much. My husband saw Gravity in 3D the other night! I chickened out. That's my "Hey, it's ok.." That I'm too much of a wuss to see movies about outer space. The government shutdown is ridiculous. Toddlers in a sandbox, but worse. I heard really good things about Gravity. Hope it lives up to all the hype when I eventually watch on DVD! Our daughter went through an American Girl phase. We have 4 or 5 dolls to prove it and one horse. She enjoyed them so much and loved changing all their clothing. I found a place on ebay that made fabulous clothing for them and she enjoyed all the outfits and changing them. Now they seem to just hang out and yet I can't seem to get rid of them either. I'm with Tom, a Barbie Jeep would be a much better spend! I have been away from Blogger for a while (maybe I'll add a new post today) and so I did not know that your husband is back from deployment. Yea! My sister's 3rd husband was in the army and I know there was no greater feeling in the world to her when he returned home. 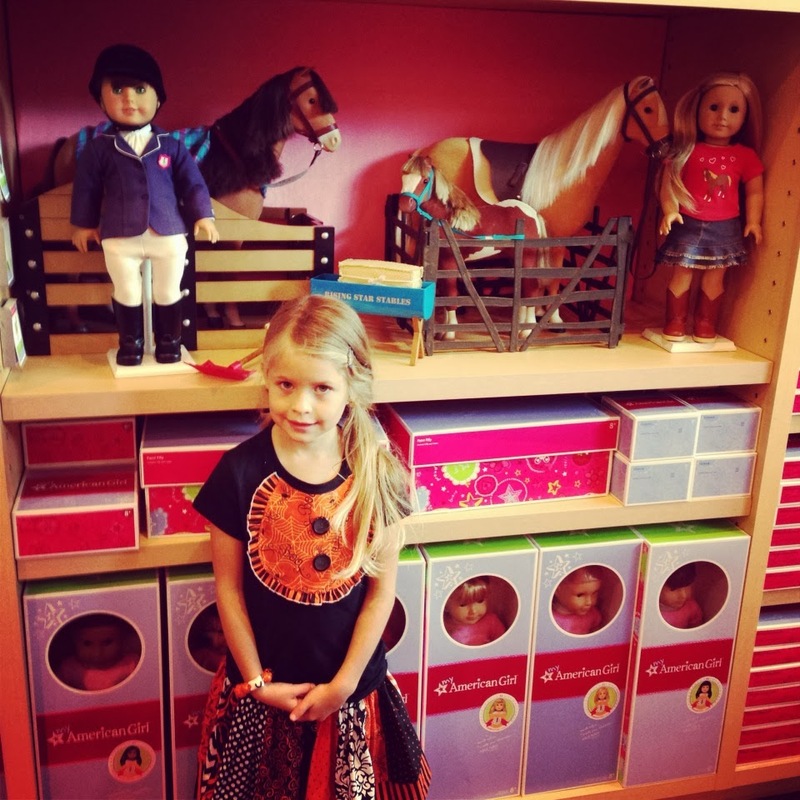 I would love to get Shelby an American Girl doll. I should get her one before she is done playing with dolls. Seeing the dolls in the tall boxes there in the picture - that is how a doll should come, in a tall box. Makes them extra special some how. As for the government shutdown, I wish it was over. In fact I wish it never happened. I have some friends whose husbands work in government operated offices who cannot return to work until it is all over with. I want to put the blame on one side but truth is, it's everyone's problem who was involved - who could have stopped this before it happened. Glad to see you guys are catching up on some date nights! My hubby is around all the time and I *still* feel behind in that regard! So glad you all are getting some time together. :) That's definitely a plus after a deployment... oh and I second that the government shut down needs to be over like tomorrow. Haha. I'll have to re0read Bridget Jones Diary before reading the new book...and I'll have to wait for me new ereader to arrive. Your government is STILL shut down?!?!?! Seriously??? I've always wanted to go to Medieval times! I'm so jealous! I haven't been to the movies since the summer. I'm not really okay with that, being a big film geek -- but, I do have Netflix and I am okay with that. I'm with Tom on the whole pricing structure of American Girls dolls - so glad my girls don't like them!